The Fenstemaker Alumni House dates back to the 1920s and was partially renovated in 2001. The Husky Ambassadors Office is located in this building. 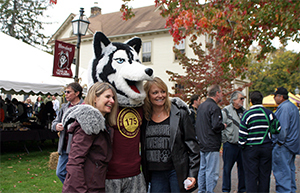 The office was established to improve relationships between students, alumni, staff, administrators, and the community of Bloomsburg. The Fenstemaker Alumni House holds Husky Ambassador events for Homecoming, Alumni Weekend, Foundation Scholarship Receptions, and other various University Advancement and Alumni Affairs events.